Alcest (1999-present) is a Black Metal band from Bagnols-sur-Cèze, France. lcest started as a solo project of Stéphane Paut (know professionally as Neige), who as a child, had dreams about a "Fairy Land", "a place with colours, forms and sounds that do not exist here"; the music of Alcest would be highly influenced by these dream experiences. Soon after, the band became a three-piece black metal outfit, consisting of Neige (vocals)/rhythm/acoustic guitar/drums), Argoth (bass) and Aegnor (lead guitar; now known as La sale Famine de Valfunde). By 2009 the membership had all left but drummer Winterhalter from Les Discrets (and ex-Peste Noire) joined Neige in the studio, after eight years of collaboration. Since the Tristesse hivernale demo 2001 the act has released Le Secret EP (2005), Souvenirs d'un autre monde (2007), Aux funérailles du monde... / Tristesse hivernale Split (2007), Les Discrets / Alcest Split (2009), Écailles de lune (2010), Le SecretEP (2011), Autre temps Single (2011), Les voyages de l'âme (2012), BBC Live Session Live (2012), Opale Single (2013), Shelter (2014) and Kodama (2016). 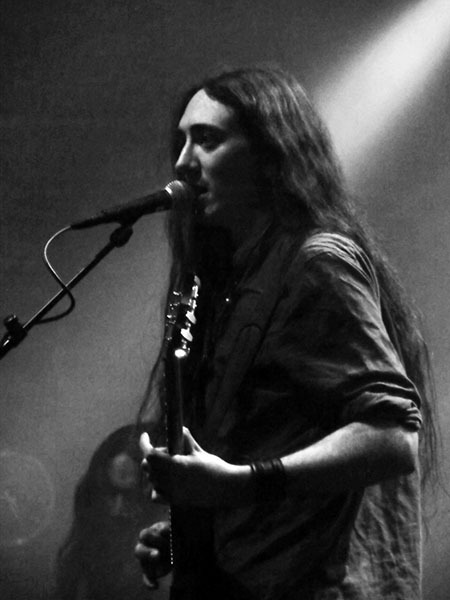 Neige of Alcest performing live at Roadburn 2011. Photo by: Astrid Tonella.